The Untitled Magazine is delighted to announce the release of its most anticipated issue yet: the “Music” Issue 6. The 224-page issue highlights more than 165 global musicians with exclusive interviews and photos shoots with over 70 of the most inspirational and influential artists shaping the music industry today. From global DJs to hip-hop luminaries and indie band sensations, the “Music” issue is entirely devoted to the global music scene. Offering a one-of-a-kind personal look into the lives and careers of each musician and band with exclusive interviews, photo shoots and behind-the-scenes videos, The Untitled Magazine has intimately captured some of the most talked-about, cutting- edge artists on the airwaves. 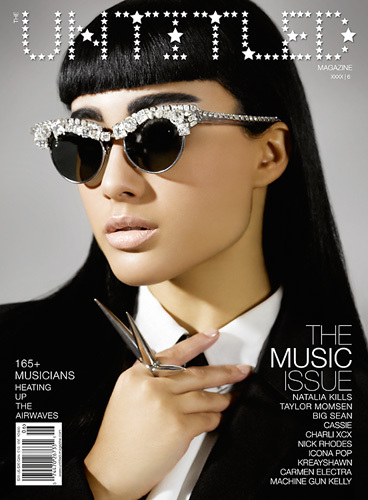 The “Music” Issue 6 presents a global perspective on the industry’s movers and shakers with four cover stars: Taylor Momsen, Natalia Kills, Big Sean and Machine Gun Kelly – as well as inside features on international artists such as A$AP Rocky, Bat for Lashes, Carmen Electra, Cassie, Django Django, Delilah, Haim, Icona Pop, Kreayshawn, Kate Nash, Lady Gaga, Neon Trees and Wynter Gordon, to name a few. Duran Duran’s iconic Nick Rhodes provides an exclusive interview on his TV Mania project as well as reveals his magic behind the lens with a six-page fashion spread featuring pop star Charli XCX. Designer John Varvatos sits down with Editor-in-Chief, Indira Cesarine for an exclusive interview about his legendary collaborations with music icons such as Jimmy Page, Green Day and Axl Rose. Aaron Marcellus, Alexandra Burke, Alexandra McDermott, Alexz Johnson, Andra Day, A$AP Rocky, Bat for Lashes, Ben Montague, Biffy Clyro, Big Sean, Bip Ling, Blondfire, Carmen Electra, Cassie, Charli XCX, Charlie Siem, Chelsea Leyland, Chelsea Tyler, Coleman Feltes, Dan Black, Delilah, Dionne Bromfield, Django Django, Dry the River, Early Morning Rebel, Elle King, Foxes, Haim, Icona Pop, Imogen Heap, Io Echo, Jesse Wood, Jewel, Jihae, Jjamz, Kate Nash, Kerli, Kreayshawn, Kristian Marr, Lady Gaga, Laura Comfort, Liza Thorn, Lianne La Havas, Lloyd Polite, LP, Machine Gun Kelly, Marion Corrales, Maya Jane Coles, Medina, MS MR, Natalia Kills, Neon Trees, Nick Rhodes, Noah Becker, Oberhofer, Paloma Faith, Purity Ring, Ren Harvieu, Sharon Van Etten, Sky Nellor, Soko, Spector, Ssion, T. Mills, Tamara Kaboutchek, Taylor Momsen, The 1975, The Joy Formidable, Wild Belle, Wynter Gordon and Zara Martin.